Addie hardly recognizes her life since her parents divorced. Her boyfriend used her. Her best friend betrayed her. She can't believe this is the future she chose. On top of that, her ability is acting up. She's always been able to Search the future when presented with a choice. Now she can manipulate and slow down time, too... but not without a price. Meanwhile, her best friend, Laila, has a secret of her own: she can restore Addie's memories... once she learns how. But there are powerful people who don't want to see this happen. Desperate, Laila tries to manipulate Connor, a brooding bad boy from school - but he seems to be the only one who can help her. As Addie and Laila franctically attempt to retrieve the lost memories, Addie must piece together a world she thought she knew before she loses the love she nearly forgot... and a future that could change everything. 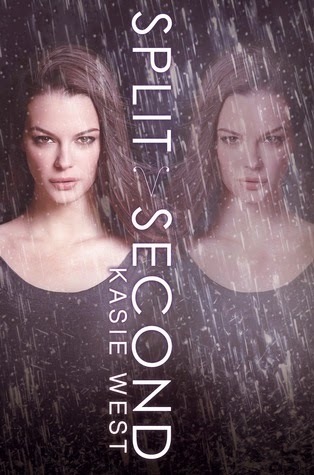 As soon as I finished Pivot Point, I immediately got my hands on Split Second and jumped straight in. The ending of the previous book was good but heart breaking at the same time. Even though the ending was not a cliffhanger, I still needed closure over the repercussions of Addie's decision at the end. So thank goodness, I didn't have to wait a whole year for the second book to come out. Last warning: please read the first book before continuing on with this review, although it's spoiler free for this book, it will contain details regarding the first book, possibly spoiling Pivot Point for you. In Split Second, Addie has to live with the repercussions of the choice she made six weeks ago. In need of a change of scenery, she decides to take up her dad's offer of staying with him for the winter break. But living in the Norm world brings its own challenges. Not only does she have to hide her ability, an issue that's growing more difficult as she gets to know a boy named Trevor, Addie is also uncovering things that have the potential to shake her world and what she knows about her family upside down. Back in the Compound, Laila is racing against time. A note Addie left for herself reveals to Laila that she needs to restore Addie's memories - if only she know how. To do so, she recruits the reluctant help from Connor,the one boy who seems to be able to help her and the one boy who refuses to fall under her charms. Similar to Pivot Point, Split Second also alternates between two story lines that are initially separate and distinct. Addie struggles with adapting to the Norm world while Laila trying to find a way to develop her ability. But gradually, elements of the two separate story lines begin to merge with one another until they intertwine to become one story line racing towards the climax. Once again, the highlight of this series is the romantic developments. I got so much feels and emotions whilst reading this book. The chemistry between the characters are so heartfelt and the memories of "what could have been" in book 1 come back to haunt in a very beautiful way. I initially didn't enjoy Laila's story line as much as Addie's. Laila comes across as a bit brash and determined to get things her way. But as pieces of her background begin to be revealed, Laila became more relatable and her story line just as interesting, particularly as things began to heat up between her and Trevor. The reason I didn't enjoy this book as much as the first one is because the plot line I felt is not as strong as the first one. The way Pivot Point unfolded, intertwined and reached its climax is so clever. And the ending is good yet so heartbreaking at the same time, leaving just a hint of hope for the future. Split Second's plot isn't as straight forward and clear cut, making it slightly confusing as to which direction this book is going. The ending is a bit rushed and I would have loved to see more of the couples before the book reached the ending. I still enjoyed this book. As it stands, this is a lovely duology. But if there is a follow-up to Split Second, I would definitely pick it up in a heartbeat.